Health has become very expensive nowadays, many people have started to notice the important of their health. This issues though is usually used by many food and supplement companies to get as many profits as possible. Not a good one, but fair enough if the product is really giving what they meant. That’s why we can prove this problem with Nutiva Hemp Protein. This product is claiming to be a very nutritious and healthy food. Hemp is a rare plant which will improve your health after consuming it, however, to consume it is really hard, so companies and factories start to mass-produce it in powder shape. Nutiva Hemp Protein will give you many nutrients which will strengthen you in your daily activities. However, even though Nutiva Hemp Protein is made with all natural ingredients, but the process itself is not very natural whereas the hemp is processed into powder. So if you want to know about this, let’s see the explanation below. Nutiva Hemp Protein contains high-quality plant protein which has branched-chain amino acids. This amino acids chain has been proved to be a strong component of our body. It can be used for your digestive system, or even to give us more immunity. Nutiva Hemp Protein also contains 66% edestin which is a bioactive globulin protein. This protein is easy to digest and fulfill your need for protein. Other than that, Nutiva Hemp Protein also contains nine essential amino acids, with the addition of one essential fatty acid. This nine essential fatty acids can be found in many products, but what makes it unique is that Nutiva Hemp Protein has these many nutrients in one subject, which is amazing. Nutiva Hemp Protein is made through a long process, but what makes it a relief is that Nutiva doesn’t use the hexane solvent when cold-processed. So rest assured, this product has gone through a very solid process. 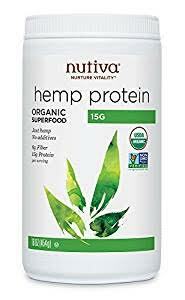 And just for your note, Nutiva Hemp Protein is a vegan food; it doesn’t use any meat in its ingredients, so for you who is vegan can consume this protein. The performance itself is pretty decent, Nutiva Hemp Protein is usually consumed as meal or snack. You need to mix it with a proper amount of milk before consuming it. Nutiva will become a very healthy snack which gives you raw protein, fiber, and phytonutrients, absolutely no lactose or trans-fats in it. The downside, though, Nutiva has an unpleasant taste, you will probably need to adapt to its flavor for a couple of your first week trying it. You are highly recommended to try Nutiva Hemp Protein. Not only that this product is made with good process, but it also gives a lot of good improvement for your body. However, for you who can’t eat a bad-tasted food, it would be a waste not to try this food. Check the best price for Nutiva Hemp Protein here!